By the end of this year, there will have been 252,710 new cases of invasive breast cancer among women in the U.S. (komen.org) No matter your circumstances; chances are that your life has been affected by breast cancer. 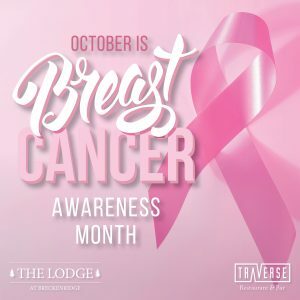 The Lodge at Breckenridge recognizes the tragic impact breast cancer has on all of our lives. We will be donating $1 from every lodging reservation and a portion of the sales from three specialty dishes for the whole month of October, Breast Cancer Awareness Month. Proceeds will be donated to the inspiring Susan G. Komen Foundation. If you want to learn more about what you can do, about their movement, or just about the disease, please visit their website for more information.